One of them also mentioned that there was a State Department official who commented on the not guilty verdict. I looked for it but couldn’t find it. I did however, find this page in an article. The highlight on the bull – and the statement above it about the cow (danger to vehicles) is because it is a similar story to what happened in Idaho to the Yantis family except that Jack Yantis was murdered. The insurgency in our country uses the same playbook so that everybody knows the script when it is media story time. 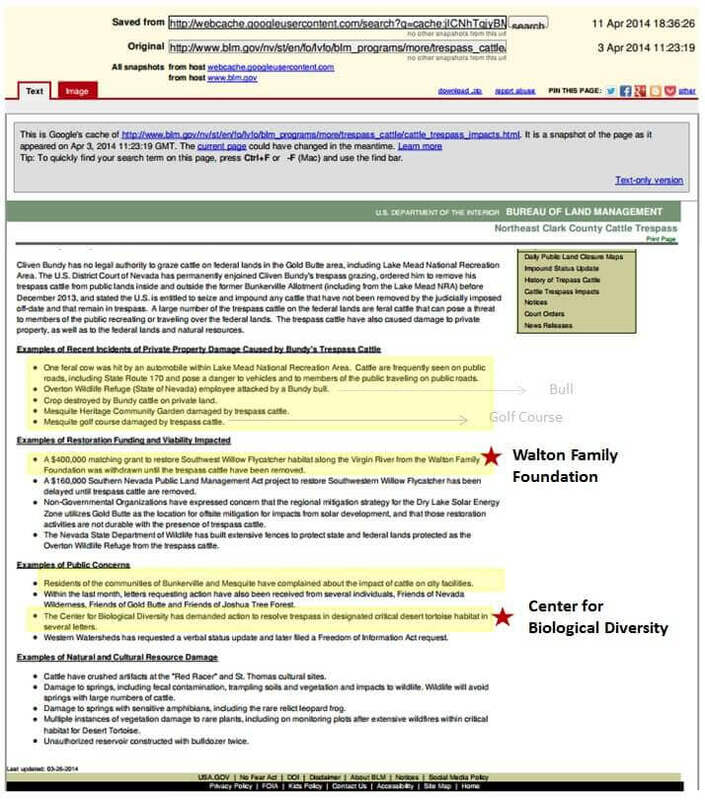 The Center for Biological Diversity was involved in “making the case” against the Bundys in Nevada and they were involved in Oregon. The involvement in both Nevada and Oregon using boilerplate objections (i.e. fill in the blank of the never before heard of critter that is endangered) areas on the same grounds is a pattern of racketeering when viewed within the larger context of grant money and an agenda that will be described below but for the moment, take a look at this – Patterns and Clues. 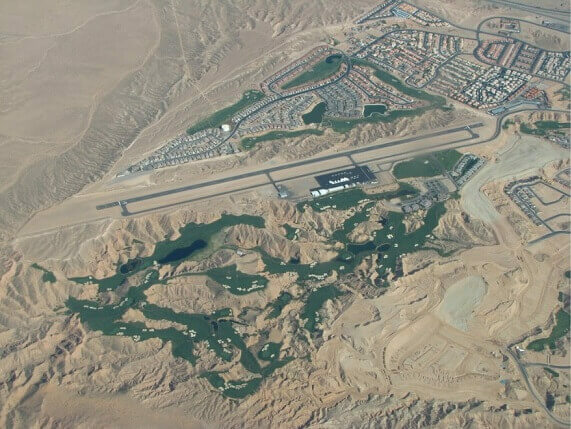 The reference to the golf course puts the Bundy Ranch and/or their grazing allotment within the zone to be designated an intermodal commerce zone. The $400,000 grant by the Walton Family Foundation brings up the question – Is the EPA still using extortion of corporations to achieve their dubious “environmental goals” which in the case of the Bundy Ranch means stealing their property. Carol Browner was the EPA Administrator under the Clinton Administration. The extortion racket she set up in Florida is described in this video by a man who worked for her – who was introducing her. It’s noteworthy that Carol Browner was and is a member of the Socialist International. Dirty Harry’s interests are found in the blurry boundaries between foreign and domestic law/policy and in particular, U.S. foreign policy that benefits corrupt politicians who enabled the slow and quiet occupation of our country. That policy is found in the New Transportation Policy announced in 1990 and authorized in the Intermodal Surface Transportation Efficiency Act of 1991. This legislation began the planning for and construction of an international transportation system centered around transportation hubs, telecommunications and IT systems. For an international transportation system, those hubs become international ports. 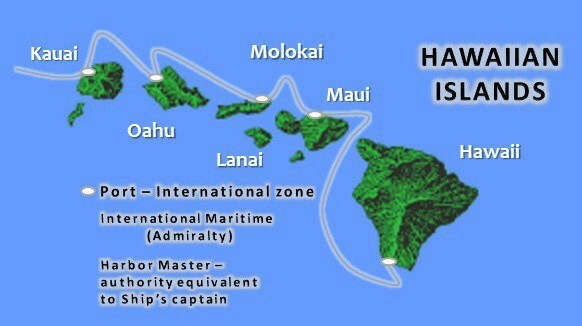 The easiest way to think about this is to picture a shipping lane and a chain of islands with ports. Below is a graphic showing one of the routes for the Alaska Marine Ferry Highway System. The idea is just to show how voyages aka sailings are recorded. It’s port of origin to port of destination. The ports between are just stops on the route. The convention of ports of origin to ports of destination doesn’t become an issue until you consider landlocked countries. 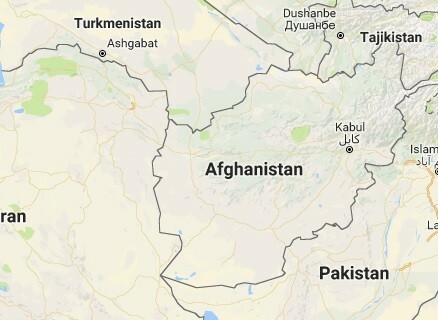 Afghanistan is a good example of a landlocked country. The right of “innocent passage”. A flagged vessel engaged in international shipping may not be denied innocent passage through a state (nation – or in the case of the U.S., a state of the nation). Waterways that are navigable to and from the sea are considered international waterways and are regulated under Maritime (Admiralty) Laws. In the Intermodal Transportation Efficiency Act of 1991, the Intermodal Commerce Zone as a defined location on the Interstate Highway system would be a transhipment zone under Admiralty Law. An intermodal commerce zone becomes an inland port jurisdiction in a landlocked state and the zone authority becomes a Port Authority – Harbor Master when a new jurisdiction is created under law. In Idaho, the Intermodal Commerce Zone law in Idaho created a new jurisdiction, a Port Authority within the state that is chartered, has its own seal and can create debt through bonds – similar to what a city can issue. Since the Interstate Highway System goes from coast to coast and crosscuts the country North to South beginning at navigable waterways or ports on the seaboard, plus the design of it to cross international borders with Canada and Mexico, the Interstate Highway System becomes a network of international shipping lanes under Admiralty Law with Intermodal Zones actually being Port jurisdictions under international Admiralty Law. The zones in the United States are part of a global transportation system design. The Ports – inland and seaports are part of the network that could be called Global Auschwitz – transportation hubs and “workforce development zones” in a global network of zones. `The purpose of the National Highway System is to provide an interconnected system of principal arterial routes which will serve major population centers, international border crossings, ports, airports, public transportation facilities, and other intermodal transportation facilities and other major travel destinations; meet national defense requirements; and serve interstate and interregional travel’. 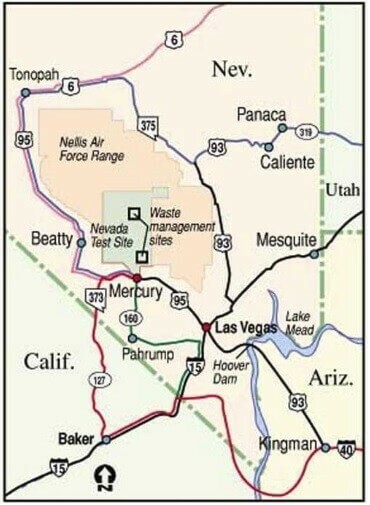 Recall that in the BLM notice of cattle trespass, they mentioned the Mesquite Golf Course – which means that the Bundy ranch and their allotment is in the location where an intermodal commerce zone aka – inland port would be located. 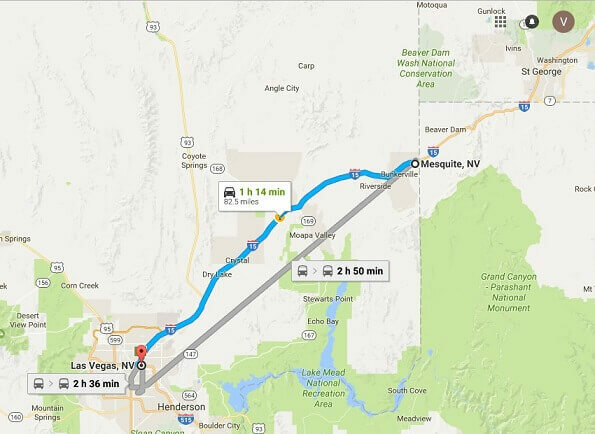 The four images below show the location relative to the airport and golf course plus the location of the Interstate. The planning for the New Transportation System announced in 1990 was already underway before it was even announced. 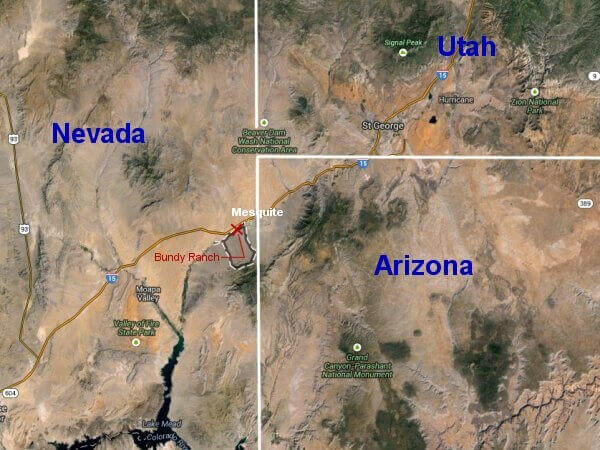 The harassment of the Bundys and their neighboring ranchers began in about 1992 which is about the time they would have been identifying the locations that were to be designated as Ports and Inland Ports (i.e. transshipment zones) on the Interstate Highway System. There is no doubt in this writer’s mind that federal politicians – such as Harry Reid knew about the Transportation Plan and would have been ahead of the public in terms of land speculation. Racketeers like the Center for Biological Diversity are also useful in terms of bogus environmental claims when in reality, they are just vultures who covertly work in whatever way necessary to get control of property before the transportation plan is known to the owners. In effect, we have two systems of law and jurisdiction in one country. We have the Maritime – Admiralty law in Port Jurisdictions and we have our Republican, representative government based on the U.S. Constitution. Here is the trick with Port Authorities… they can buy and sell property that automatically expands their jurisdiction. The Port Authority of New York/New Jersey was created by an act of Congress in 1921. Initially, it was just the harbor areas across the Hudson River but they’ve expanded to cover over a 1500 square mile area in New York and New Jersey. The following is a map that was found on the Federal Maritime Commissions website showing the “Marine Highways”. They don’t mention that what extends the “marine highway” is the creation of an inland port jurisdiction. As I said above, Idaho law provides for the creation of an inland port jurisdiction. Since the concept is so foreign to non-seaboard states, it had to be that the legislation was provided to them by either ALEC or the Uniform Law Commission in Chicago. On the MARAD website, there is a little video to watch. They don’t mention the international law aspects of what they are doing. MARAD Fact Sheet. What they did mention in the video is the technology. Booz Allen Hamilton designed the technology systems for Ports and the corridors. This kind of ubiquitous technology is very expensive with no return on investment if paid for by the public so they are using Foreign Direct Investment which is where the Communist Chinese come into the picture. When George H.W. Bush issued Executive Order 12803, he was opening the door for the sell-out of the American people and our resources to foreign powers. The Communist Chinese company tried to establish a technology zone in Idaho that would have been within the jurisdiction of “The CORE” which would have been a Port jurisdiction. A Chinese national company is interested in developing a 10,000- to 30,000-acre technology zone for industry, retail centers and homes south of the Boise Airport. Officials of the China National Machinery Industry Corp. have broached the idea — based on a concept popular in China today — to city and state leaders. They are also interested in helping build and finance a fertilizer plant near American Falls, an idea company officials returned to Idaho this month to pursue. This ambitious, long-term proposal would start with a manufacturing and warehouse zone tied to the airport, and could signify a shift in the economic relationship between the two superpowers — a relationship once defined by U.S. companies like the J.R. Simplot Co., Hewlett-Packard and Morrison-Knudsen that would head to China to build and develop. Because of Elaine Chao’s family history that includes her Father’s shipping company, Foremost Shipping plus her own history of working for the U.S. government that includes being the Chairman of the Federal Maritime Commission, the Secretary of Labor and the Under Secretary of Transportation for Elizabeth Dole when she was Secretary of Transportation, there is absolutely no way that Elaine Chao would not of understood the implications of the design of the New Transportation Policy. Because of that, she should never again be involved in any government job let alone be the Transportation Secretary for the United States. As it pertains to the Bundy’s and their ranch, all the information that I’ve brought forward here should be used by them in their defense. They were made targets by the federal government’s 1990 Transportation System that at it’s core was a treasonous plan to allow our country to be occupied by foreign nationals within Port jurisdictions. They have been the victims of eco-racketeers – pirates who fly the flag of environmentalism when their real objective is to facilitate the transfer of ownership of the target property. The idea of the “mitigation zone” is creative – but pure bovine excrement. “Resolution Condemning Bigotry” — A Missed Opportunity! A SPECTER is haunting the United States of America —the specter of Cultural Marxism. Muslim Inbreeding Has Corrupted Islam’s Psyche – And The Results Are Alarming! Right Side News is your online newspaper, publishing accurate information about threats against Western civilization. Right Side News stands out among news sites, offering the right news from sources you can trust. Find out what the real news is while there is still time to make a difference in your home, your community and your nation.